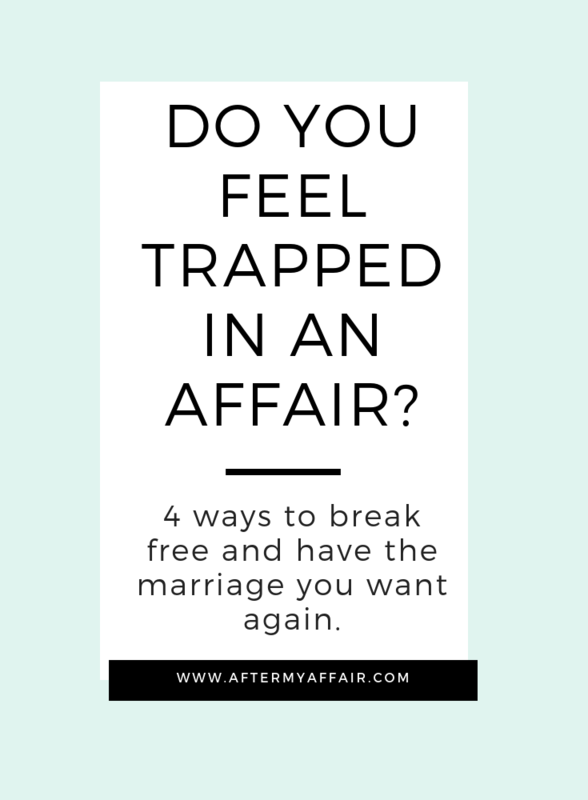 Do you feel trapped in an affair? And having a hard time breaking it off for good? confused about decisions you need to make. who’ve never found themselves in that situation. as most people don’t just “wake up” and find that are in an affair. But for those who find they have committed the biggest offense a marriage can be dealt, it happened all too quickly. Did you drift apart from your spouse and now find yourself in an affair? Also read my post, married but in love with someone else. I understand because I have been there, you can read my story here. It happens as much to women as it does to men. Many people eventually realize they should end the affair but may feel ambivalent too. But there is a way out of the affair. 1. Believe you can change. Change your mindset and the words you tell yourself. If you’re really tired of living a double life and tired of feeling trapped in an affair, but don’t know what to do now, I am glad you’re here. During that time, I kept saying “I can’t live without this man.” “I don’t know how to break it off.” And many statements like that. Well, how could I break it off if I kept telling myself I couldn’t? How about you? What are the things you keep repeating to yourself about the affair and your affair partner? Are you sabotaging your own recovery and making it harder to end the affair by your own words? Have hope that your marriage can be saved, and move in that direction to make it happen. Yes, nobody can make those promises for YOUR marriage but both of you. It takes two to work on a marriage and both you and your spouse have to really want to make it work. No, it won’t be easy. There will be pain along the way. But, if you are anything like me, you are already in a boatload of pain and it couldn’t get much worse than where you are now. It starts with ending the affair. There are steps that my husband and I took to get to a place of healing and eventually trust again. We didn’t do it right all the time. There were setbacks, a lot of them. I kept waiting until I thought breaking off the affair would get easier. It didn’t. But I got so tired of being in the affair, and feeling stuck and truly divided, I was willing to do whatever I needed to do. You’ve also got to get to a point where you really want to change. If you wait until you really ‘want to want to’…your life will probably get much harder. Make the decision that this isn’t going to be your life any more. Decide what you want your life to be. Is this it? 2. Nothing worthwhile is ever easy. I kept telling myself that. My husband also told himself that. Infidelity is an awful, traumatic event like no other. Even all these years later, it is still a sore spot for me. And in a different way, it’s a sore spot for my husband. We’ve healed. But I think there will always be a scar there like there is after an injury. There’s no way around that. But we have a choice in our marriage everyday, and you do too. 3. True love changes and grows through the years. Sometimes we expect the love ‘feelings’ we had in the beginning to always stay the same. It won’t. But that doesn’t mean it’s worse. It grows into a mature love. One that’s not dependent upon just feelings but unconditional love and support. How can any marriage be the same as it was on your wedding day? We grow, we change and hopefully we learn to grow together, not apart. That doesn’t mean it has to be boring though. Once we can accept that the love in our marriage can be strong again, we’re more likely to give up the affair. Even if you have to create a new marriage with your spouse, make it better the one you had before the affair. There is hope for your future and your marriage, if you and your husband want it bad enough. 4. You don’t have to live with a torn heart and there is a way out of the pain and heartache. It helps to understand why ending an affair is so hard, which I share 5 main reasons, in this post. Although our story will be different than yours, I believe you can have hope that it IS possible to break free from an affair and heal your marriage again. than I believe there is still hope, healing and forgiveness for YOU. If you’ve been unfaithful, healing for you is important too. God will never give up on you, no matter what you’ve done. I truly believe that because I lived it. I would not have been able to break free from being trapped in the affair without God helping me. Part of what I did, was pray everyday, for God to take the desire for the AP out of my heart. And he truly did! So, if you’re tired of feeling trapped in an affair, the first steps are to get real with yourself. Recognize you have some control over what happens next. Do you want to be well? Do you really want your marriage to heal and be better than it was before? It all starts with ending the affair. If you’d like to know more about us and our marriage story, click here.